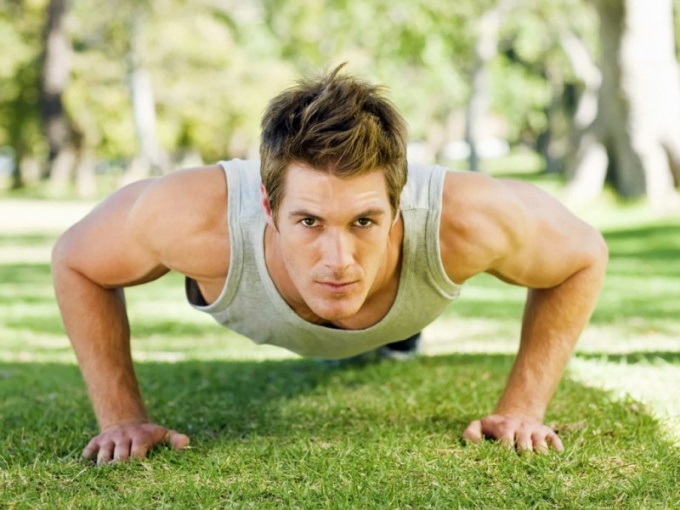 Using push-UPS to maintain good physical shape, to train endurance and muscle strength. These exercises can be performed not only in the gym, they do not require special equipment. There are various techniques and secrets of effective training. In the process of systematic push-UPS effectively pumped chest muscles and triceps. The choice of the methodology of training depends on your specific goals and physical capabilities. You can do push-UPS from floor, parallel bars and even between two chairs. Technique push-UPS in General is not very difficult, exercises can be performed in a rack with fists and palms. In the first case, you will strengthen and temper the shock of the hands, which is important for effective training in the martial arts. If you set a goal to significantly increase muscle strength and gain muscle, you will need the help of a partner. It is either his direct action or through additional burdens laid on your back, will create a resistance to the movements of your body by adding and removing weight as needed. In case you want to become fitter and make my muscles more visible, you can do push-UPS without additional weights, trying to increase the number of performed iterations. There is an effective method of push-UPS, which includes the work of muscles. Its secret lies in the incomplete range of motion when lowering and lifting the torso. That is, wrung out, you don't fully bend and straighten hands in elbow joints, so muscles have time to relax and make maximum use of its own resources. To obtain good results, you should consider another point: the shorter the rest between sets, the stronger the impact from the training. But remember to monitor their well-being. Experienced athletes know that in the process of developed triceps push-UPS take a lot of pressure on yourself. They can be partly off from work to ensure the most efficient development of the chest muscles. To do this, before the usual push-UPS you must perform the exercise for pumping the triceps muscles, you can also alternate the different techniques. For example, pushups with a narrow support (the arms are at a distance of 20-30 cm from each other) combine with the exercises, which are based on conventional equipment. If you build from a few bricks stand under the arms, you can do push-UPS, stretching, and thereby the maximum pumping muscles. In this case, it is important not to make too deep backbends, it is fraught with injuries. Before the implementation of this method should warm up your muscles and ligaments. Making the last two pushups in each of the approaches, stop at the stage of 50% of the exercise (arms bent at the elbows) and try to hold this position for one to two minutes. Exercises on statics very difficult, but they likewise develop strength and endurance. The number of sets and reps in the push UPS will depend on the goals you set and your level of physical fitness. You can start with 10-15 reps and 2-3 approaches, gradually increasing the number of pushups to 50 in a row or more. Exercising this way 3 times a week for 30-40 minutes, you will keep yourself in good physical shape.